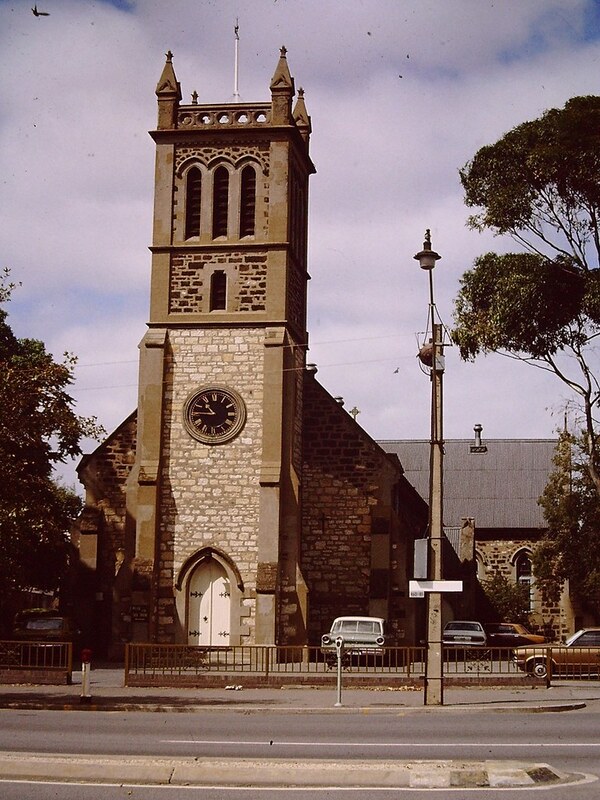 Holy Trinity Church was the first Anglican church built in South Australia and is one of the oldest buildings in the City of Adelaide. Colonel William Light, Surveyor-General for the colony of South Australia allocated the site on Lot 9, before the general ballot for city acres was commenced. 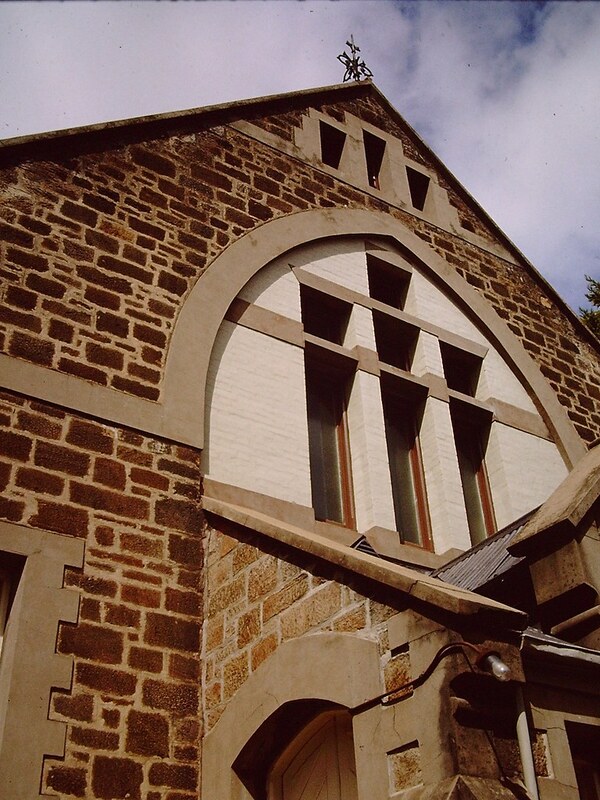 The foundation stone was laid by Governor Hindmarsh on 26 January 1838 and the first service (a baptismal service) was recorded on 21 July 1838 while workmen were still fixing the roof. The clock in the tower, which has been there since 1838, was made by Vulliamy, clockmaker to King William IV. It was intended as the town clock and was put in this first Adelaide tower. During 1845 the body of the church was rebuilt, reroofed, the steeple and the clock removed, and a vestry added. The steeple was replaced by a belfry set on top of the tower. In 1846 galleries were erected in the transepts, which were often filled by the garrison troops who marched down North Terrace from their barracks to the music of their own brass band. In 1888-89 the original building, which had remained unchanged for over forty years, was extensively altered. Then in 1958 a large gallery was added above the main entrance, and this was further extended in 1967 to accommodate 150 people. Two additional vestries were added in 1970. The Grenfell Memorial Organ, has been built in the upper section of the north transept. It is a fine instrument of twenty-three stops and 1,299 pipes in memory of Pascoe St Leger Grenfell, who gave the land on which the church is built. The instrument was dedicated on 2 February 1958, marking the 118th anniversary of the church. The Centenary Window, installed in 1937, commemorates the first 100 years of Holy Trinity Church in three panels of stained glass. For more about the church’s history you can download a 12 page history from the Church’s website or watch the video below. The church building is open for viewing during office hours, Monday to Friday, 9am – 5pm, when not being used for other church activities. Please visit the church office on arrival and they will assist you. Guided tours are available at various times throughout the year, for example, during SA Heritage Week, or can be organised on request for school groups, tourists or other interested parties. Phone( 08) 8213 7300. Glad that you found it Barbi. It’s quite a changed scene now isn’t it? Robert adams and maryann o’connell married here on 20/5/1839.our grt grt grandparents. Thanks Bev. What a great connection to have with Adelaide’s oldest church. I have been researching our family history and have found the following. Richard Arnold married Keziah Rhodes (Nee Dunstan) on 8/4/1865 in the Trinity Church Adelaide. Does the church have any documentation recording the marriage? Richard is my great grandfather BUT we are having some difficulty finding details about his life in Australia. (come from England we believe) Any information would be appreciated. Hi Bill, it might be worth exploring the State Library of South Australia’s material relating to the Holy Trinity Church, link here: http://www.slsa.sa.gov.au/webdata/resources/files/fs_fh_churches.pdf SRG 94/A2 (series 1–3 on microfilm). We hope that helps! Quite an influential lady, and a great figure to have in your family tree. Hi June, the State Library of South Australia’s church records collection does contain material from the Holy Trinity Church that may be of interest, unfortunately we don’t have the resources view the records for you but if you have any friends or relatives visiting Adelaide here are the details: http://www.slsa.sa.gov.au/webdata/resources/files/fs_fh_churches.pdf SRG 94/A2 (series 1–3 on microfilm). We hope that helps! eastern wall to Thomas Sandwell. Thank you for sharing this Malcolm, were you aware of the family connection to the church when you were married? Great pics. My great grandparents Anna Henning and Ludwig Maraun were wed in Holy Trinity Church on 10th March 1862. According to South Australian records, my Great-Grandparents were married in Holy Trinity on 27th August, 1851. I would love to have ANY details of the marriage is anything available please. 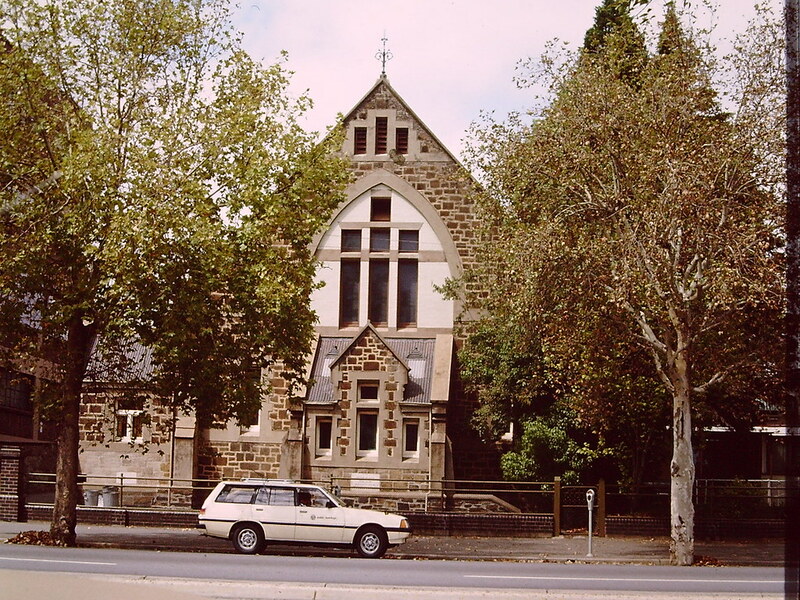 Hi Frank, the State Library of South Australia’s church records collection contains material from the Holy Trinity Church that may be of interest: http://www.slsa.sa.gov.au/webdata/resources/files/fs_fh_churches.pdf SRG 94/A2 (series 1–3 on microfilm). We hope that helps! My Great Great Grandparents, William Joseph Strumey and Jane Jones were married in Holy Trinity Adelaide on 24th September, 1838 and their daughter Prudence Elizabeth Strumey was baptised on 21st July,1839. Do you have any photos of what the church would have been like in 1838? Thank you. Hi Judy, thanks for getting in touch. 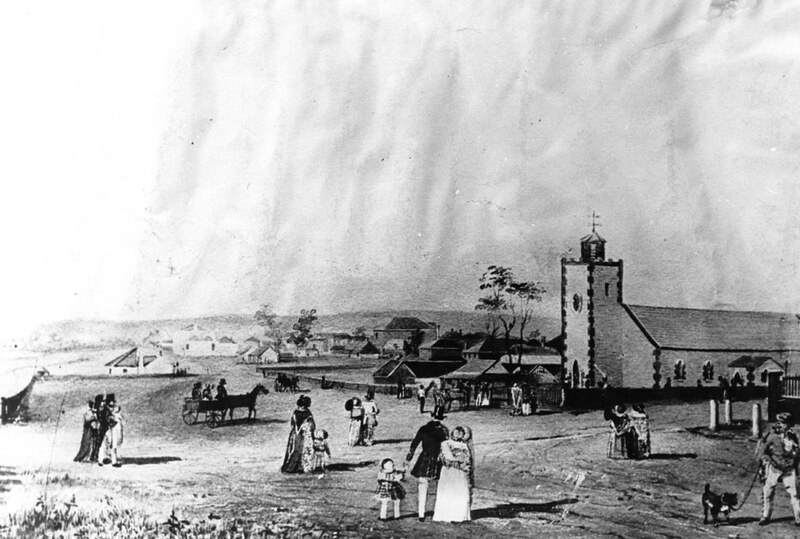 Unfortunately photographs from that era are quite rare, but this drawing is one of the earliest publicly accessible images of the church dating from 1849 http://collections.slsa.sa.gov.au/resource/B+9483/2. This map of the seating plan circa 1845 may also give you some idea of church life in the early years of the colony (and perhaps reveal some familiar names if you can decipher the writing) http://collections.slsa.sa.gov.au/resource/SRG+94/A2/142/3. My gr.gr. grandparents were married in the Holy Trinity Church in 1841…Christopher Harridge Carter and Mary Jane Grey. I have wanted to visit the church for years, and finally managed it in May this year, your kind staff let us stay in there for as long as we wanted to, thank you so much. Do you have any photos of those early weddings? Captain Robert Webster commanding a detachment of the 11th Regiment was stationed in Adelaide from 1846-48 during which time he also served as acting secretary to Governor Robe. His 7th child was baptised with the names Henry Torrens Webster in Trinity Church on 26 August 1847. It is wonderful to see the image here from exactly that time. A good image really can bring a period to life can’t it? Good luck with the rest of your Webster family research Bill!